In hindsight, I can trace my tomato pie disaster back to two things. One, I am not Southern. 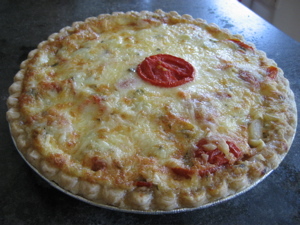 I am however, Southern-curious, which is what led me to attempt tomato pie in the first place. It just sounded so perfect…a pie made entirely from ripe, red tomatoes covered with a bubbling layer of cheese and a soft biscuit crust. I imagined myself baking it while wearing a summer dress and a flowered apron that fluttered with the breeze wafting in through an open kitchen window. I would serve it on my sprawling porch to ladies who came over in the afternoon for sweet tea. Why I thought a recipe that included a cup of mayonnaise mixed with cheddar cheese would transport me to such an ethereal place, I’m not sure (I don't even own a flowered apron). I should’ve known from experience that my elaborate culinary daydreams often lead to disappointment. But the pictures I kept finding of tomato pie were irresistible. Which leads me to the second thing responsible for my tomato pie disaster. There’s an awful lot of trickery going on out there in food magazines and websites. Just like celebrity bodies are airbrushed into perfection, so it seems is the food we eat. Recipes mentioned that the tomatoes in the pie might be a tad watery but I wasn’t worried. After all, every photo showed a tomato pie held together beautifully; firm layers of tomatoes and a browned, bubbling layer of cheese and mayo. Maybe no one else will tell you this but I will: Those photos are lies. All lies. My first tomato pie was a soggy mess of mushy tomatoes and undercooked onions drowning in an oozing layer of cheese and mayo that tasted exactly like putting a spoon into a jar of Hellmann’s. I turned the pie on its side and tomato water poured out. Calling this attempt a disaster may seem overly dramatic. But at the time, it felt like one. I threw the pie away before there were any witnesses. My recipe for tomato pie takes it far from its Southern roots. A purist might not like it. But for this West Coast girl, it was the tomato pie I’d been dreaming of all along. Slice tomatoes in half and gently squeeze most of the seeds out. Cut the tomatoes into 1/2-inch slices. Put them in a large bowl and toss with olive oil, salt and pepper. In a shallow baking pan lined with parchment, roast the tomatoes for 1 hour. Prick the pie crust all over the bottom with a fork and pre-bake it in the oven for 10-15 minutes. Remove and let cool. Sauté the leeks in a drizzle of olive oil until soft and lightly browned. Set aside. When the tomatoes have cooked for an hour, remove them from the oven and drain off any liquid. Return the tomatoes to a large bowl and mix in basil and leeks. Put the tomatoes in the pie shell. Cover with a layer of the crème fraiche and mozzarella. Sprinkle the Dry Jack cheese on top. Bake for 45 minutes until the top is browned. Resist all urges to cut into the pie until it is completely cooled.